The Job family created one of Newfoundland's most successful and enduring mercantile empires. Spanning three centuries, the business originated on the south side of St. John's Harbour at "Prosser's Plantation" circa 1750 under the proprietorship of John Bulley of Teignmouth, Devon and, subsequently, his son, Samuel. In 1789, Samuel Bulley's daughter, Sarah, married John Job, who also happened to be Bulley's ward. Bulley rewarded Job with a partnership in the business under the masthead Bulley, Job and Company, bringing an end to Job's nine year apprenticeship with the firm. From the Gerald Quinton Collection, Maritime History Archive. Similar to the bulk of mercantile firms in Newfoundland from the seventeenth century to the early twentieth century, the Job operations focused primarily on the fish trade, purchasing and exporting codfish to foreign markets, and importing goods for sale in the local market. Their clients were either fishermen or other traders who dealt with fishermen. Branches of the Job firm were also heavily involved in shipping and the outfitting of vessels for the annual spring seal hunt. In 1809, the firm transferred its English base of operations to Liverpool, where the principals maintained the tradition of coming out to Newfoundland each spring for the fishing season, and returning home for the winter. 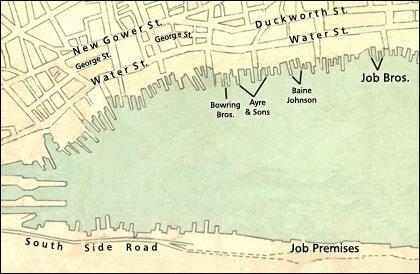 The firm reorganized in 1839 with Robert Job and Thomas Bulley Job at the helm of Bulley, Job and Company at St. John's, and Samuel Job and John Job Jr. heading up Job Brothers at Liverpool. Along the way, there had been other partnerships - Parker of Parker and Knight joined the firm, forming Parker, Bully and Job in 1808, and James Cross became a partner by 1820, forming Bulley, Job and Cross. When Thomas Bulley retired from the firm circa 1839, the name changed to Job Brothers in a partnership of Robert Job and Thomas Bulley Job of St. John's and Samuel Job and John Job of Liverpool - all sons of the original John Job. A Mr. Hooper and Stephen Rendell joined the firm in 1845 and 1854 respectively, under the banner of Job Brothers & Company. Detail from Plan of the City of St. John's, compiled by W.R. Ryan (Halifax, NS: McAlpine Publishing Co., 1909). Adapted by Tanya Saunders. During the next 100 years, Job Brothers & Company continued to evolve under a succession of partnerships. In the second half of the nineteenth century, it began to shift its focus to other industries. Between 1867 and 1872, the firm constructed three large sealing vessels, "wooden walls", providing 100,000 seal pelts annually for its south side oil manufacturing premises. In this period, Job Brothers also established plants for converting fish offal into fertilizer at Bay Bulls, Catalina and L'Anse au Loup. In the twentieth century, Job Brothers was a pioneer in artificial fish drying at its Blanc Sablon, L'Anse au Loup and Forteau premises, and was also among the first to experiment with methods of freezing fish. In one of the firm's most innovative and successful undertakings, the Blue Peter, a 5000 ton steamship, was equipped with a brine freezing system as well as a canning plant for the production of salmon. The firm also diversified into timber, mining, manufacturing and processing in the first half of the twentieth century. In 1909, Thomas Raffles Job and Samuel Ernest Job of Liverpool, and St. John's residents, William Carson Job and Robert Brown Job, incorporated the company under the title of Job Brothers & Co., Limited. They all served as directors of the new company, and brought Thomas Bulley Job, also of Liverpool, on board as a director. Hudson's Bay Company purchased a majority the company's shares in 1927, which were re-acquired by Job Brothers & Co., Limited in 1943. 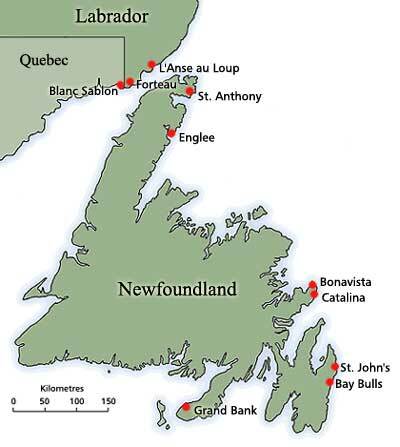 In 1945, Northlantic Fisheries Ltd., under the direction of Hazen A. Russell, procured sixty percent of the shares of Job Brothers & Co., Limited, and assumed control of the company's fish plants at St. John's, Englee, St. Anthony and Bonavista - the latter operated by the Job affiliate, Bonavista Cold Storage Company. Russell left Job Brothers & Co., Limited to take over the Bonavista Cold Storage Company Ltd. in 1952, and acquired another plant at Grand Bank the following year. Eventually the remaining Job plants were sold with the exception of the St. John's operation which closed in 1967. Job Brothers & Co., Limited was affiliated with many other renowned Newfoundland companies, including the Standard Manufacturing Co. Ltd., Newfoundland Marine Insurance Co. Ltd., Colonial Cordage Co., Blue Peter Steamships Ltd., and Blue Buoy Foods. Godden, Randall, 'The Job Family and Its Business Concerns in Newfoundland', Student Research Paper, Maritime History Archive, 103-D-5-5. Encyclopedia of Newfoundland and Labrador, Vol. III. St. John's: Newfoundland Book Publishers Limited, pp. 111-114. The Book of Newfoundland, Vol. II. St. John's: Newfoundland Book Publishers Limited, pp. 393-398. Registry of Company and Registry of Deeds, 1909, 1920, 1934.